Cars drive on the Hong Kong-Zhuhai-Macau Bridge, in Zhuhai city, south China's Guangdong province (March 28, 2018). The 55 kilometer long bridge crosses the mouth of the Pearl River, in the middle of which it briefly submerges into a tunnel that allows for passage of the largest ships. A vast crossroad just outside of Macau splits the Y-shaped bridge into the Macanese and Chinese parts. The opening ceremony – located in Zhuhai to avoid potential protests – will certainly mention amazing engineering achievements and the tremendous potential of the bridge. Since it stands in the area where one of Asia’s largest rivers meets the South China Sea – and a location repeatedly hit by powerful typhoons — technical execution of the construction was undeniably challenging. So was the construction of the multiple artificial islands that serve for border control and bridge maintenance. The bridge will be one of the most visible symbols of the Chinese Great Bay Area project that aims to emulate San Francisco’s example and connect Hong Kong, Macau, Guangzhou, and other cities in the Pearl River delta into a metropolitan area and an integrated business center with 67 million inhabitants. Few in Hong Kong are celebrating, though. The opponents of the project have a long list of objections, with the price tag coming out on top. While the idea of the bridge was conceived by the mainland officials, most of the burden is on the shoulders of Hong Kong’s taxpayers, who would rather see the funds spent on education or housing. They view the bridge as a way of transferring money from taxpayers to local and Chinese oligarchs, whose construction firms built the whole project. Despite receiving a hefty check from the government, the builders still tried to save on the construction material. Due to the low quality of cement, artificial islands started disintegrating and drifting away only a few weeks after completion. Low safety standards lead to nine deaths and hundreds of injuries of construction workers. A parliamentary control found falsified stress tests, for which two supervisors where handed jail sentences. And a detail: The bridge will never recover the cost of construction. Traffic projections have been reduced by one-quarter, since China is building a parallel bridge just 30 kilometers to the north. The lifetime of the construction is only 80 years – for comparison, half of the bridges to Manhattan are older than 80 years and work perfectly fine. Environmentalists are challenging the bridge as well. The construction has invaded the habitat of the critically endangered pink dolphin, which only survives in this area. But it is not only dolphins that are in peril – all sea creatures are affected when large amounts of sand are dumped on the seafloor. That permit will only be granted to 150 private cars a day and the applicants – Hong Kong permanent residents only – have to prove they are employed or have a firm in Macau. If there are more than 150 applicants on any day, and licenses will be distributed via a lottery. The lucky drivers will still not be able to make it all the way to Macau: they must leave their cars in a car park just before the entrance to Macau and continue with public transport or taxi. 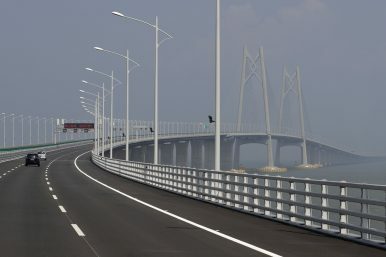 The journey also comes with two border controls, and if one’s destination is China, drivers need to change lanes in the middle of the bridge, as traffic drives on the left in Hong Kong and Macau, while on the right in China. Currently, high-speed ferries take passengers from Hong Kong’s business area to Macau in exactly one hour, plus a few minutes clearing immigration on both sides. The same trip will take about 2 hours when using the bridge – not counting the time spent safeguarding all necessary permits. Plus, the bridge is 45 minutes away from downtown Hong Kong, has a low speed limit, requires two border checks, and will take time to get from the car park to central Macau. The bridge will never recover its costs. Hardly anyone can drive on it. Why was it built then? The answer is politics. On the one hand, the local government depends on the support of oligarchs; therefore, it is important for the officials to maintain good relations with the city’s richest people. Nothing will please a tycoon more than a large construction project from the government’s budget. No wonder such projects are nicknamed white elephants, after a Buddhist legend in which a white elephant is an undesired present, as it has no value, yet it needs to be taken care of. A second, more important explanation is the attempt of the Chinese government to accelerate and deepen the integration of Hong Kong into China in order to weaken the separatist moods in the city and limit the spread of subversive ideas such as press freedom, human rights, or an independent judiciary. A bridge that connects two autonomous regions with mainland China is a perfect weapon in the propaganda department’s arsenal. Martin Sebena is a Ph.D. student at the University of Hong Kong and a research fellow at the Institute of Asian Studies in Slovakia. More Troubles for China's Southern Mega-Bridge ProjectHong Kong’s Extradition Changes Tap Into Fears of Diminished RightsWhat China’s Greater Bay Area Plan Means for TaiwanWill Theresa May Discuss Hong Kong in Her China Visit?What’s Behind Li Ka-shing’s Billion Dollar Sale in Hong Kong?